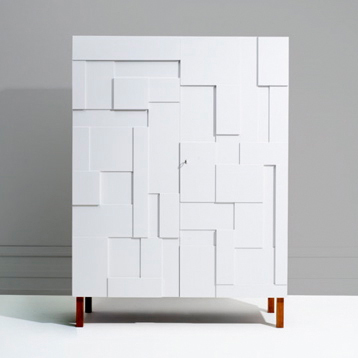 British cabinetmaker and designer company Pinch has launched a new collection of hand-crafted storage furniture called Armoire Collection. The range consists of three designs, called Alba (top), Marlow (above) and Frey (below). Each comes in a range of configurations and internal storage options. All are inspired by mid-century plaster relief art and involve high-quality cabinetry, with each piece built by an individual cabinetmaker. The collection comes in colours designed by Pinch for paintmaker Siecle Colours. Pinch is a new company set up by designer Russell Pinch and his wife Oona Bannon (below).